Not long ago your ICS infrastructure was safe from outsiders. No longer. Threats are emerging on various fronts. Insiders with purpose or good intentions gone wrong, the result is the same. 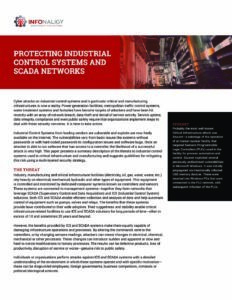 Having control of your ICS network is more important than ever. Cyber Security largest growth market in IT over the next 3 to 5 years – Your will hear from every IT company with a new offering. Today’s security tools not developed to be kind to 10, 20, and 30-year-old equipment. Good intentions will cause meaningful financial impacts and equipment loss. What Can You Do To Protect Your ICS Infrastructure? Use a dedicated system (laptop) loaded only with the “tools to do the job” to connect and manage your ICS network. Ensure it has antivirus, antimalware, and its firewall should be running. Segregate the ICS network. Do not allow any systems that are constantly connected to the internet to be connected to your ICS network. If you need to actively collect data from your ICS network use a physical firewall with advanced threat detection capabiliites. Allow only certain IP’s, protocols, applications. Engage with IT / Cyber Security companies that have proven experience working with Industrial Control Systems, and can provide references.